You can multiply this by 4.343 in order to obtain in decibels, or take the exponential of it to get the power amplification factor. A substantial challenge lies ahead: how to calculate the overall gain in the steady state? The equation above seems to make it easy, but how to know the required gain coefficients at all locations in the fiber? After all, these depend on the local pump and signal powers, and we don't know these yet! They in turn depend on the yet unknown excitation densities. Obviously, we need to find a self-consistent solution for the optical powers and excitation densities at all positions in the fiber. In some situations, this is relatively simple to get. 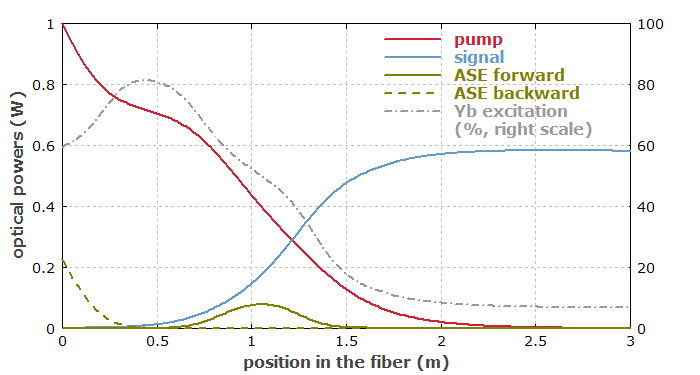 For example, if you have only a copropagating pump and signal, you can calculate the excitation density at the input end, get the local pump absorption and signal gain from that, and use it to propagate the powers a small step into the fiber. There, again calculate the excitation densities, the gain and absorption, etc. ; just iterate this procedure until you have reached the fiber end. Situations with counterpropagating signal and pump are not necessarily difficult, except if there are multiple waves. For counterpropagating signal and pump, it is a bit more difficult, but you can use the shooting algorithm. Start at one end with the signal input and a rough estimate of the pump power remaining there. (It depends on the excitation of the fiber, which is not yet known.) Then propagate the pump power together with the signal to the other end. (The pump power will grow in that direction; you propagate it backward!) At the signal output end, you will generally find that the pump power doesn't fit the actually injected pump power. However, you can then refine your guess and iterate the procedure until you have the self-consistent solution. The challenge with relaxation methods is to obtain fast and reliable convergence. There are other algorithms such as relaxation methods, where one propagates powers with estimated distributions of the excitation densities and later changes these to reduce errors. The challenge is to get such procedures converge nicely, i.e., both quickly and reliably. Here, reliability is rather difficult to get, as the behavior of such algorithms can be influenced strongly by various parameters of the amplifier. As this part is really hard, you may enjoy very much to have a piece of software which does that job for you. For example, our RP Fiber Power software uses a very refined algorithm which does the job quickly and reliably. As a user, you just provide all the inputs and get the solution without any hazzle. Figure 1: Optical powers along the length of an ytterbium-doped fiber amplifier. The resulting degree of Yb excitation is highest not at the input, where the pump power is highest, but a bit inside the fiber. This is because amplified spontaneous emission (ASE, see part 4) in backward direction becomes strong at the left end. The pump power first drops quickly, then less rapidly where the Yb excitation is highest, and more quickly again. The fiber length in the example case was somewhat longer than ideal. Note, however, that changing a fiber length can modify ASE power levels in unexpected ways. So one should rather calculate such things rather than just guess. So we clearly see that the evolution of powers in the fiber depends substantially on the Yb excitations, whereas these of course are determined by the power levels. The resulting behavior can be quite complicated, so that even experienced persons are often surprised about the simulated results, and confused about unexpected experimental results. Go to Part 4: Amplified Spontaneous Emission or back to the start page.